Ground power supply is a vehicle used for supplying power to aircraft parked on the ground. 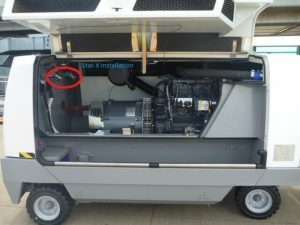 The electric energy is carried from a generator to a connection on the aircraft via 3 phase 4-wire insulated cable. Due to the compactness of these vehicles it’s very hard and not cost effective to install conventional fire suppression systems. A handheld extinguisher has been in use for ages to fight the fires from these equipment’s, which is not effective for these kinds of applications because they are not automatic, which gives a lag time for the time to spread and sometimes makes it harder to extinguish. Anytime current flows, whether during generation or transmission, a byproduct of that flow is heat. The greater the current flow, the greater the amount of heat created. When this heat becomes too great, protective coatings on wiring and other electrical devices can melt, causing shorting, which leads to more current flow and greater heat. This heat can become so great that metals can melt, liquids vaporize, and flammable substances ignite. Carbonization of insulation can also lead to fires on aircraft wiring this is called wet tracking, which takes place due to the combined effects of moisture and pollutants on the surface of wiring. The same can happen if there is a considerable amount of aging on the wiring. Personnel who attempt to work with electrical equipment and have no knowledge of the principles of electricity can also be responsible for a fire accident. Since, these power generation units use flammable liquids as a fuel to generate electricity. There is also a Class B fire risk also involved in it. Which is caused mostly due to operational activities. Since the majority of fires in this application is a result of flammable liquids and electrical wiring, which falls into Class B & Class C (as per NFPA). Stat-X has passed the rigorous testing for Class B and Class C fires by Underwriter’s Laboratory (UL) as a suppression technology for fighting these fires by using total flooding technique by breaking the chain reaction of combustion without any depletion in the normal levels of oxygen. Being an environmental friendly product Stat-X generators can withstand temperatures more than 100o C and operates normally with less installation and maintenance costs. 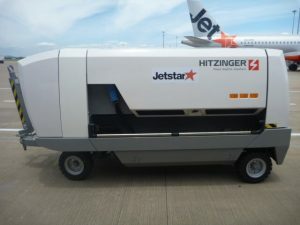 Stat-X electrical activation systems are installed in many of these ground support generators as a perfect alternative for the conventional systems and handheld extinguishers because of their compactness Stat-X can be installed inside these equipment. Which gets activated by a linear heat detection cable when there is a fire. Stat-X generators can also be operated manually. Since these equipment’s are mobile the installed systems can go with it without removing the system from these equipment. If the system is removed it can be installed very easily since it doesn’t require any piping and floor space. An installation photos in a similar piece of equipment.